Another challenging moment (there have been a few during the last 8 days). This time a large ice floe had drifted across our floats and was threatening to drag them out of position and probably causing another tangle. Some slick maneuvering with the bow thruster by yours truly and Sandy on the frwd deck with the throwing grapnel we managed to pull the floats clear and haul the line. Fishing has been very good lately, better than last season, and probably one of the best starts we’ve had for the Ross Sea Toothfish season strengthening the knowledge that this is a sustainable fishery. As predicted for this time of year the ice is thawing quite fast now and we anticipate heading south through the maze of leads and rotting ice floes to gain access into the Ross Sea within the next 2 weeks. It’s usually around Christmas day we start heading south and this season appears much the same as others with the massive ice thawing process. Adam (aka Sharp shooter) in the hauling room with an XXXL Patagonian Toothfish, (Dissostichus eleginoides if you happen to speak Latin). Some of these fish grow to 150kg and bigger, this 85kg Toothfish was caught in 1,800m deep water where most of the big fish live. In shallower water, between 800 and 1,000m, the average size fish is 7 to 9kg. We are not permitted to set lines or catch fish in water shallower than 500m within the South Georgia, South Sandwich fisheries management zone. The main Toothfish spawning grounds are to the North West of South Georgia, around the shag rocks area between 200 and 400m. Once Shooter has cut its throat, the fish is placed on a conveyor to the bleeding tank. From there it will be moved into the factory for processing, then weighed, labeled, packaged and into the blast freezers, usually within 2 hours of being caught. The water temp ranges between -0.8 and +0.8 for most of the winter season so our product quality is as good as it gets. Adam says Hi to his family back in NZ.. He’s a hard worker and always ready with his camera when something interesting is going down. (Unless he’s right in the middle of the action that is). PS: I did have a nice (proper photo) of Francois, but it seems to have gone missing from the photo files. Something fishy happening here. I have finally got a photo of Francois for you. Francois is our compliance officer/factory manager. He is responsible for keeping the records straight and sending our daily catch reports to the Sanford office, South Georgia Government and CCAMLR. To comply with the Marine Stewardship Council (MSC) accreditation we have to provide what is called a Chain of Custody (COC). For the system to work, our daily reporting must be accurate to the kilo when we unload our catch at the end of the trip. It is a reasonably complicated system and Francois manages this very well. The bottom line is: every fish we catch has a barcode attached that will go with it showing the time and location it was caught for the consumer, wherever that may be. If the paper work isn’t accurate we could loose access to our market, or worse, we could lose our license to catch fish. We must forgive Francois if he looks a little stressed. Francois working at his office station on the port side of the wheelhouse. As you can see he is still a little sensitive about his hair cut….. I think it looks fine….. besides, it will eventually grow again! NB: Francois has asked me if he can spruce the photo up a little before sending it through the satellite system. Its ok with me…..I assume he has done that. Even though the ship’s air conditioning system keeps the accommodation areas warm throughout the season it gets very cold in the factory. We have to use a large diesel heater to blow warm air over the frozen blocks of squid bait to thaw them out for setting. The heater also warms the factory deck a little but not enough to be comfortable. Throughout most of the season, and more so from the end of January on, there is ice accumulated over the main deck and halfway up the ship’s sides, inside the factory. The factory is a continual hive of activity with fish processing, packing, freezing, glazing then stowing the product down in the main holds. There is also biological sampling done on the first 25 fish off each line we haul. The official observers, with the help of the crew, gather all sorts of information and samples from the catch. These samples must also be packed, frozen and carefully stowed in the hold and later shipped off to scientists to be analyzed. Marli and Bull sampling the first 25 toothfish off each line. Ren with a good-sized fish; that one was about 75kg. Tangled lines are a common problem for all that go fishing with hooks. Some of them are huge. This tangle was a beauty with about 500 hooks, 700 meters of 11.5mm backbone (line), all made a little more difficult with 120kg of chain and anchors along with 1,700 meters of downline leading out to the 3 large windy buoys or floats on the end of this line. It took the boys an extra couple of hours to sort this lot out before we could set another line back. It’s cold on the hands working in the hauling room, more so if you’re unlucky enough to get wet too early in your shift. The only way to sort a tangle like this one is to whip your gloves off and get stuck in. Sea temp is -1.5 and air temp -2,…….Roll on the end of that 8-hour shift ! Ren, Matt, Bull and Josh in the hauling room as they man handle the nightmare aboard around the main hauler. The Hiab (deck crane or winch) is always handy at times like this. Matt, Josh and Bull hauling a good sized fish aboard, this one was about 60kg. We have finally made our way through the maze of ice fields and into the Ross Sea. It has taken us 6 days to cover 300 mile of longitude to the south. In that time we probably traveled around 1,000 nautical miles as we weaved our way along leads, around ice bergs, between ice floes and through broken melt ice as we searched for the safest track in. 1 of the 100's of ice bergs we're seen in the last few weeks. But it’s all worth while now that we are on the fishing grounds and enjoying some good calm weather conditions that are typical in the Ross Sea for this time of year. When the ice bridge finally thaws, in another 2 or 3 weeks, the weather pattern will change again and allow some of those Southern Ocean low pressure systems to track further south. 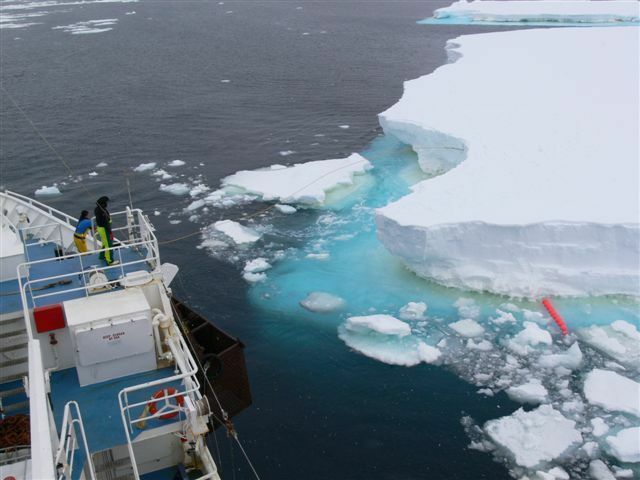 Until then, we are quite happy with sea conditions that you are more likely to find on a lake than here in Antarctica. I find it difficult to describe the many different sights we see in these waters, even though its all just ice. Anyway, we all just keep clicking off photos and hope a good one comes up now and then. An ice flow with shattered ice piled on top. This is a small scale example of the pressure the ice fields come under when it all starts to thaw in spring. I wouldn't like to be down here then. Ice flow with shattered ice piled on top. I’ll have some fishing photos soon. Ps: There were 4 commitments to knock off smoking as a new year resolution. We’ll see how that goes in the next few days. It’s snowing again as another cold front passes over. Generally, weather conditions are reasonable at this time of the year once we get south of 65 degrees. Heading southwards from there, many of the low pressure systems are moving in from the west pass well to the north of our position. This gives us more weather from NE and easterly directions and therefore we don’t get hammered by the continual westerly storms that are typical in the southern ocean between 45 and 60 degrees south. Today the air temp is -2, sea temp -1, visibility 2nm, but only 100m when the snow showers roll over. Moderate low sea with 5-10kts northerly winds. We can see the ice edge to the south on radar as we track it moving slowly S-SE about 2nm a day. As the ice retreats south it also thaws and becomes easier to pass through. Just for now we’re doing ok on the fishing front with enough fish to keep the crew busy for much of the day but we are looking forward to getting to the main fishing grounds in the Ross Sea when the ice eventually thaws. In a couple of weeks about 60,000 square mile of ice will have melted or broken up, giving us access into the Ross Sea down the traditional 180 degree Longitude track. Vessels have been entering the Ross Sea via this route since Sir James Clark Ross discovered the area in 1841 in his ship the Erebus, after which he named Mount Erebus. Mount Terror, right next to it, was named after his support vessel. All hard workers need feeding well and it’s no different aboard the Antarctic Chieftain. Mike is our cook and he’s been doing it for years, preparing three hot meals a day for 22 hungry crew, the first at 04:00hrs, another at noon then dinner at 20:00hrs. Variety is the key after 4 months at sea and Mike is king at that. He prides himself in his ability to create something different every day. From Lamb racks and Beef Wellington to Bacon & Egg Pie, fancy Spaghetti dishes, not to forget the Toothfish. Most chefs would scrub pots for a week to have the chance to experiment as Mike does, with one of the World’s most sought after fish, which is usually destined for top class restaurants. Mike cooking toothfish - you have to taste it to understand! Ordering provisions for the trip is not as straight forward as it may seem, but when the company you work for recognises the need for some luxuries on a long voyage like this, the job is made a little easier. By the end of a long trip, if he’s got it all wrong, and we’re running out of the basics, I’m sure the boys will let him know. That is usually incentive enough to get it right from the start. We have been fishing for 4 days now on a deep ridge just north of the ice edge, around 65 30s 178 30w. Results are slow as these areas are notoriously difficult to work. Foul grounds with many rocky outcrops and under sea pressure ridges that snag our lines on the bottom and, above that, strong currents combine to create real challenges for fishermen in these latitudes. Many of the depths we work are between 1,400 and 2,000m, that’s a mile down and a long way to haul a longline from. Usually it takes about 1½ hours just to get the anchor up! Several fish on one of the lines we hauled today came up showing signs of encounters with Colossal Squid, 1,850m down. The attached photos are showing Matt, one of our crew, holding a 35kg Toothfish that has been attacked while hooked on the line. You can see the huge sucker marks and the giant sized bites left by the Squid as she ate lunch. Occasionally a Toothfish will come aboard with remains of Squid in its stomach, indicating that, this time round, the toothfish had won the struggle.